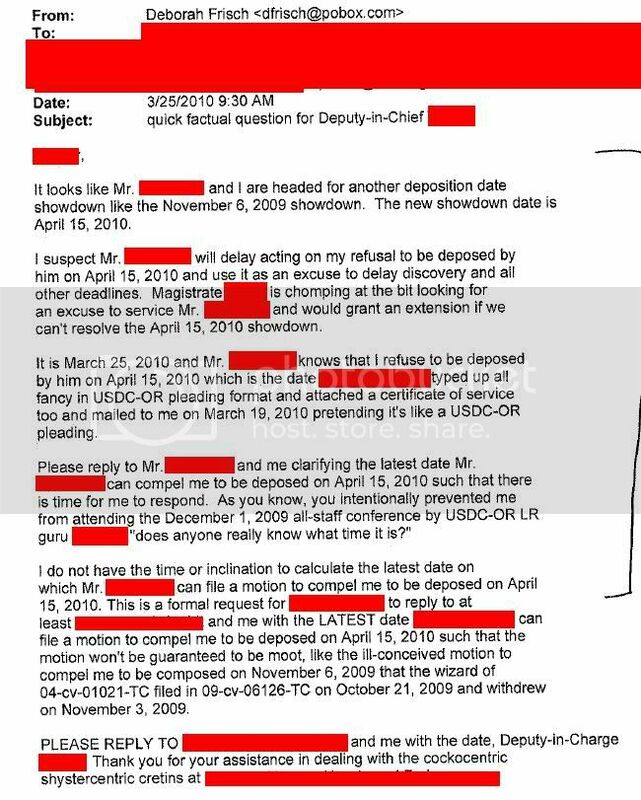 DEB FRISCH HID FROM APRIL 15th DEPOSITION! CITY OF EUGENE MOVE$ FOR $ANCTION$! Eugene (April 26)--Deborah Frisch, fearing humiliation, DODGED a scheduled April 15th deposition concerning her frivolous lawsuit, according to legal briefs filed in Federal Court today. In response to Debbie's no-show, City of Eugene has filed a Motion for Sanctions against Teh Deb. Teh City moved for Little Miss Debbie to pay $515 for teh fees of teh attorney and a court stenographer, who waited for Debbie to show at 9:30am on April 15th. 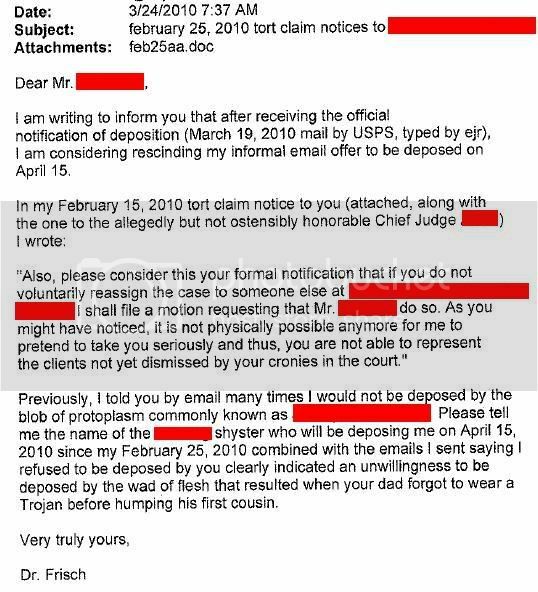 In an email sent on March 25th to teh Federal Court's Deputy-in-Charge, Frisch hurled the vulgar epithet "cockocentric" and insinuated teh judge "serviced" an attorney for teh defense. This bit of batfrisch could end up haunting Debbie moar than she anticipated. Teh Deb has already been warned (twice) that her vulgar abuse of court staff could invite judge-initiated sanctions--"including," warned teh judge on January 7th, "dismissal of claims." Can't Outwit Teh Lawyers? Harass 'Em! Teh Declaration also included several letters where Debbie heaped invective upon lawyers charged with standing up to Debbie's bullying. As veteran Deb-watchers know, this is Miss Debbie's only maneuver: once she's losing teh battle of wits (which is, like, always), Debbie resorts to limp-lobed tantrums to win teh day. In teh civil action of 2006-07, Debbie tried to bully a Denver attorney. 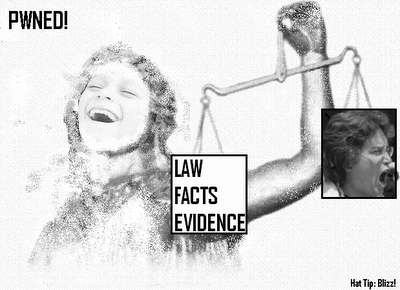 Deb's effort failed--she was slapped with an injunction (and her blog was shut down). In teh criminal case against her in 2008-09, Debbie tried to bully prosecutors into dropping charges against her. Deb's effort failed--she was slapped with a 3-year probation term (and forced to pay restitution to her assault victim). Debbie seemed to believe that, when it comes to harassing your opponents in court, Teh Third Time would be Teh Charm! Early on, emails from October 2009 showed that Teh Deb, losing to superior intellects, was trying to win through intimidation. Teh judge overseeing teh case, nauseated by Debbie's vile childishness, needed to give Debbie slap-downs teh following month, and in January. As today's forceful maneuver by City of Eugene's attorney's demonstrates, Debbie's bullying strategery will prove a quick route to EPIC FAIL. And Gerbil Nation? This editor tried to contact various members of teh gerbil "Inner Circle" for comment--but all were busily attending to a "Pwn Debbie"-themed martini and champagne party. Cheers! Just as fleeing the scene of a crime is regarded as an admission of guilt, refusing to be deposed in a civil case is regarded as an admission of no valid cause for the suit. Prepare to be pwn'd, Debbie Ellen. Personally, I think she should be placed on a mental health hold. She's clearly insane, thinking she had a case (EPD cut you a break, dummy Deb, and then you assaulted the Good Samaritan who tried to help you - yer a genius, alright! ), abusing the court and its officers, refusing to follow the rules and procedures. Deb's relatives should cut her loose, stop subsidizing her abuse of others, and make her get a job, or place her in an institution, where she can't hurt herself, or others. You know I'm right, Frisch family. Thanks to teh Squeak for an extra-special LULZapalooza issue!!1!OMGPWNAGE! You are to be commended, sir, for your valiant efforts to keep up with this vile yet boring lackwit.